This blog allows discussions to be held on various machine safety topics including safety design, safety legislation, safety standards, risk assessment and much more. Receive expert commentary from safety specialists or share an opinion or perspective of your own! What’s the hold-up with the new Conveyor Safety Standards? Increased information on guarding options and methodology. This information should be used within the requirements of any state legislation (ACT/Regulations) or codes of practice. Increased attention on the lifecycle activities of the equipment, such as risk assessment, installation, commissioning, decommissioning, etc. For those who have been paying attention, there has been a significant delay since the public comment period of AS 4024.3610 and AS 4024.3611, which ended in February 2014. So why has it taken so long to publish these standards? To avoid confusion, the new standards will only be released once all of the sections are ready for publishing. This allows AS 1755 to be fully superseded in one step. So in conclusion the new set of standards will provide improved guidance for conveyor safety and the process is still moving forward, however the new standards will only be available once they are all ready to be published. Unsure what all this mean for you? Want an overview of the different machine safety standards in Australia and how these tie in with OH&S requirements? Want to help on knowing how to select the applicable standard when designing a safety system? Well register and come along to the information session below. 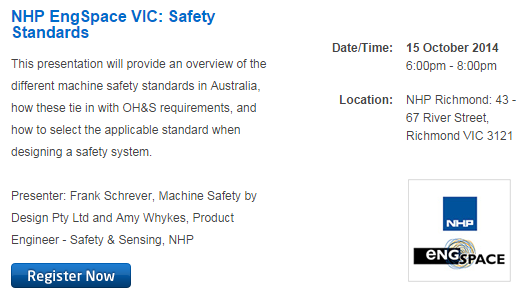 NHP Electrical Engineering Products in conjunction with EngSpace are holding a Safety Standards session with guest presenters Frank Schrever, Chairman - Standards Australia Committee and Amy Whykes, Product Engineer - Safety & Sensing at NHP. Register for a Safety Standards Workshops led by a TUV trained Safety Specialists. 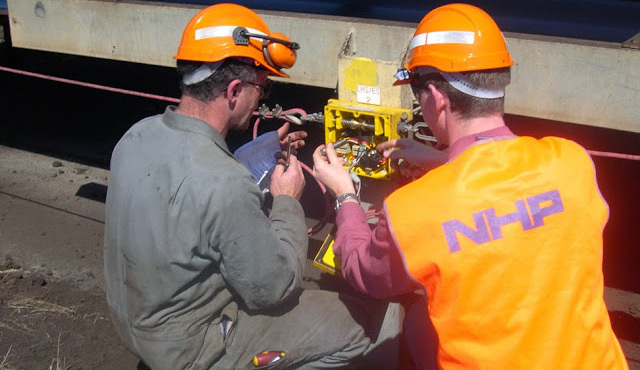 With over four decades of electrical and engineering industry excellence, and driven by a team of over 900 quality personnel, NHP Electrical Engineering Products Pty Ltd is a revered market leader where the aim is simple – to provide ‘what you want, when, where and how you want it’.